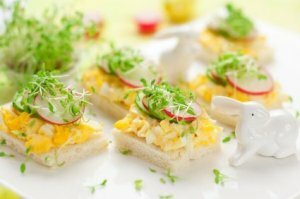 Planning an Easter brunch sometimes means looking for new ideas. This guide contains Easter brunch ideas. 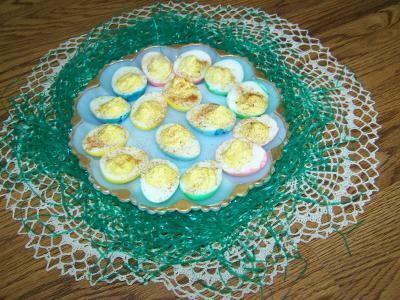 This is a 5 star Easter Brunch recipe! Place bacon in a large, deep skillet. Cook over medium high heat until crisp and evenly brown. Drain, crumble, and set aside. Place the cream cheese, milk, and eggs in a medium bowl, and beat until smooth with an electric mixer set on Low. Stir in Swiss cheese and green onion, and set aside. Separate dough into 10 biscuits. Press into the bottom and sides of each muffin cup, forming 1/4 inch rims. Sprinkle half of the bacon into the bottoms of the dough-lined muffin cups. Spoon about 2 tablespoons of the cream cheese mixture into each cup. Bake 20 to 25 minutes in the preheated oven, until filling is set and rims of the tarts are golden brown. Sprinkle with the remaining bacon, and lightly press into the filling. Remove from pan, and serve warm. I am not sure what to have for lunch on Easter. I have a 4 year old daughter, so I would like it to be Easter or bunny themed. I cannot seem to find any ideas. Wouldn't a basket of Easter Eggs be enough related to the Easter Bunny bringing the eggs, and then have whatever food you would normally have. Let your daughter peel your hard boiled eggs before dying them then make deviled eggs from the colorful eggs. I use a cold food coloring dye completely safe. Put the yolks and all other ingredients in a plastic ziploc bag and let her squish it into the filling, cut a small tip off one corner and let her fill the eggs. They may be a little messy but after all Easter is all about the children and family. An Easter Bunny cake is simple to make by baking a 9x13 cake. Check out my blog as I will post pictures of the pattern today. Have fun. Getting your 4 year old involved in making the meal might be as much fun as anything for her. How about helping her make muffins or an easy salad both of which I will post recipes for on my blog for all. You could have cotton candy for dessert-fluffy bunny tails! Have her draw on a 11x17 paper -or sticker, etc., a placemat. Eat a "veggie garden"-how? by serving veggie pizza! For a "project", get a small box (for each person) of jelly beans, and paper and crayons. Have each person graph/draw the number of each color of jelly beans. For example, if you have 3 yellow, write "3", and then draw 3 yellow circles, even if you have to help your child, it would be a fun time! If you get a bunny shaped cookie cut out, you could make ham n cheese sandwhiches and cut them out in the bunny shape. I'm having an Easter Brunch for my family. There will be about 18 people. Does anyone have some good menu ideas for this? I know it's a bit late for planning but I need something that can be kept warm and still taste good. I plan to have cold fruit, like cantaloupe and grapes. These recipes come from my mom, who just happens to be the best cook in the world! They are the ones she makes most often when we all get together for brunch. The first recipe (for the strata) is my favorite. And, it can be put together the day before so you have more time to spend with your guests. Hope you enjoy! This strata is really easy to make. Ive even made it and gotten compliments (quite a feat!). It can be put it together the day before; then just remove from the refrigerator and bake. Ham or bacon can be substituted for the sausage. Place sausage in a large, deep skillet. Cook over medium-high heat until evenly brown. Drain, and set aside. Layer bread cubes, sausage, and Cheddar cheese in a lightly greased 7 x 11 baking dish. In a bowl, beat together the eggs, milk, salt, and mustard. Pour the egg mixture over the bread cube mixture. Cover, and refrigerate at least 8 hours or overnight. Remove the casserole from the refrigerator 30 minutes before baking. Preheat oven to 350 degrees F (175 degrees C). Bake 50 to 60 minutes in the preheated oven, or until a knife inserted in the center comes out clean. Let stand 10 minutes before serving. Preheat oven to 375 degrees F (190 degrees C). Lightly grease a 9 x 13 baking dish. In a large bowl, mix hash browns, ham, cream of potato soup, sour cream and Cheddar cheese. Spread evenly into prepared dish. Sprinkle with Parmesan cheese. Bake 1 hour in the preheated oven, or until bubbly and lightly brown. Serve immediately. You could buy the small jelly beans or M & M's fill the jars up with them. Make a bunny out of pompons (big white one for the head, small black ones for the eyes and half of a white pipe cleaners, a black triangular felt nose, small black felt mouth) all hot glued together and put on the lid. Paint the lid a nice pastel pink or green color and then glue everything on it. If you like you could print a bunny picture off of your computer then just glue some of that plastic easter grass and print of bunny on the lid and a piece ribbon around the lid. How about a ham- you can bake and serve at room temp. A cheesy potatoe casserole, salad w/cranberries and pears, maybe a quiche or the strata recipe above and the fruit that you mentioned is a good idea. I need a food item for Easter. We have lunch at our church once a month. I need something cutesy with an Easter theme. For Halloween I made the orange slice pumpkins, and for Christmas I made the marshmallow snowmen. They were both great hits. I need another idea now, please help me. How about an Easter basket cake! 1. Prepare the cake mix and bake the cake in two 8 inch rounds according to package directions. Cool completely. 2. Cut a circle out of the center of one of the layers, leaving a ring that measures 1 1/2 inches from the outer to the inner edge. Place the uncut layer on a serving platter and frost the top. Place the ring layer on top of the frosted layer, and frost the sides and top of the basket. Decorate the sides and top by pressing candy pieces into the frosting. 3. To tint the coconut, combine water and green food coloring in a medium bowl. Stir in coconut with a fork until evenly tinted. Place green coconut grass in center of cake basket. If you are making cake, try a bunny cake. White cake mix, white frosting, coconut flakes, bunny ears from card stock (and decorated), and a pack of snowballs (marshmallow confection covered in coconut), decorative candy (licorice laces, gumdrops or use some creativity). This is really simple: Bake a round cake, once it cools, cut along center so that it is two half circles. Place cake pieces standing up on flat edges, frost in between and merge together. At this point it looks more like a "sunset on the ocean" but bear with me. Frost the cake completely, sprinkle coconut over entire"body" (the cake). Place one snowball at the bottom of one slope (this is the fluffy tail). Place ears, licorice whiskers, gumdrop nose/eyes on opposite end. I hope everyone can understand without a photo, I made this last Easter but didn't take a picture. Bunny nest cupcakes are fun. Make any cupcakes, frost with green tinted frosting. Tint coconut green by putting a few drops of green coloring into a Ziploc with the coconut and work the color into the shredded coconut. You may want to add a few drops of water. Sprinkle coconut on, or dip cupcakes into coconut, add a few jellybeans in the frosting. Easy to serve and everyone gets their own "nest."